I've been lurking about here and the main board for quite a while but haven't posted before. Anyway, me and the girlfriend have about a 20% deposit for the kind of houses / price range we're looking at. I'm very reluctant to buy anything at the moment especially before the end of the year with the budget / cuts to come. I think I've been reading the main board too much tho, with all their talk of still 30-40% drops to come I have gotten a bit spooked ! We've already had those drops over here, close to 50% or more haven't we ? How much more do you realistically expect them to drop ? I've been watching property bee and see people taking £10k of here and there over the past months so i'm under no illusion that they're going up in price or any of the cr*p the media spew out. I do expect them to drop another bit, but how much ?! I'm sure when the banks start throwing out money again the people who seem to like to pay as much as they can for a house will drive prices up again, but hopefully that's a while off yet. Come the end of the year if things are still unsettled i'm tempted to rent to get out of the parents house, but don't want to be stuck in a 12month lease if something comes up we want at a good price, or prices actually start going up again. Soooo If a house now is £150k what do you realistically expect it to go down to, or what would you buy it at ? I'm aiming to buy at rateable value -15% , or better. Imho that's 12 months away in my area. I wouldn't get too hung up on asking prices as they are all over the place at the moment. 1. The banks are hoarding repos to keep the market up. This can not last forever. 2. The government is bailing out 14000 mortgage payers at the moment, again a very short term move which cannot last. 3. It is unlikely that the kind of mad lending will be seen again in Northern Ireland in out lifetimes. 4. Government spending cuts are going to hit NI very very hard. With regards to the drops we have already had; this depends very much upon the area. Some people do seem to say such drops have occurred but my area of interest (North Down, East Belfast) has seen nothing like 30-40% across the board. The houses which made it to £180-200k are now £160-200k. Some have dropped (a bit, maybe 10-15%) but most are not much changed from the peak. The problem is that the headline figures we see are for the actual sales and these are the ones who have reduced. A lot of people are stubbornly refusing to move on price. I think in general you have to approach the market realising that a lot of people are not actually willing to sell at current market value. As for what is to come... the harsh reality is not yet here. If the market fails to correct properly (i.e. not just the desperate few sellers) before the money all starts moving then there will be a bloodbath as rates rise and people are forced to sell. Not sure if it's been covered here before but wont the civil serpents getting paid large lump sums to leave (and I'm still not sure it will ever happen, they will cut services to zero before considering their own for cuts) just pump all that money right back in to housing and nullifying the cuts effects on housing? Well, for a while at least. I don't think they'll move into property. + I doubt many lenders would lend to people who don't have jobs - nor much prospect of finding a new one. House price crash, what house price crash? House prices only go up. The main stream media have been reporting house prices going up according to the Halliwide reports. I'm looking forward to the Nationwide quarterly report due out next week. I'm sure when the banks start throwing out money again the people who seem to like to pay as much as they can for a house will drive prices up again, but hopefully that's a while off yet. Im guessing you have saved long and hard to get a 20% deposit, im also guessing that if ure concerned about the prices dropping that you are prob looking to buy a house that is pretty much at the top of your budget. No need to do this if you dont have to, especially given the current climate. Could be if u wait another year that you might be able to buy a whole lot more house than you could now. The last thing u want to do is buy an entry level house that you have no plans to stay in long term and then find ureself in negative equity and basically stuck there. My advice is to stay living with ure parents for the time being, what u have is the benefit of time. You owe the banks nothing, you have a deposit, you are in the prime position to take advantage of the market when the time is right. Plus you are saving on the other associated housing costs of running a house such as heating, electric etc. All the signs point to the fact that the housing market is in decline. I know it might seem rubbish living with the parents but hey, it will help you continue to grow that 20% deposit u have managed to save so well. How much lower will it go ?? ... who can say. What I will try to do but is re-assure you that if it does 'bottom out' dont be fooled into thinking that it is ever going to rise again sharply. ... re-assure you that if it does 'bottom out' dont be fooled into thinking that it is ever going to rise again sharply. Prices are still falling here in Northern Ireland. And no real sign of the bottom yet. History shows it will bottom for several years. Just on The One show... Belfast is the negitive equity capital of the UK. I think you should follow this sound advice from Fraser Houses, snapped from todays Belfast Telegraph homefinder supplement. That's if your definition of living is instant negative equity! Edited September 23, 2010 by HPCwhen? I won't believe a word of it until Helun Carswrong gives the green light. How desperate is that ad! 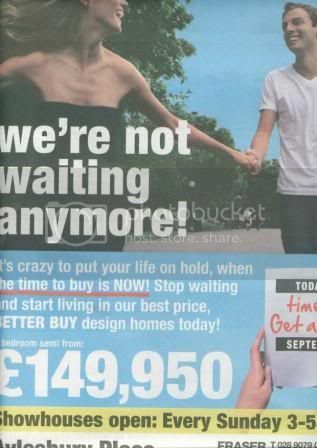 Shes a bit bony , maybe they are suggesting you need to spend your food money on a house "start living in our homes! stop eating to afford them!" I think he means the gov't won't cut jobs but save money by not doing anything. I can't see that working, they will have to make big budget cuts and that means labour. The number of civil servant per head in N.I. has been targeted directly by the prime minister, so I would expect something to happen to that figure. As for the original post, N.I. clearly got the biggest boost in the boom, and need to suffer more than other areas of the UK. The 40% we have had so far is not the end of the bust. If you look at the average property price history there is a sudden increase at the ceasefire, did people suddenly get paid more..NO!, did the population suddenly increase...NO! Investors came in and inflated a bubble, property was no more intrinsically valuable than before (unless more people wanted to come here, they didn't in big numbers until the EU widened, but those mostly were not permanent residents). To get back to pre-ceasefire level of affordability (wages to prices) we need another 50% drop from here. There maybe other factors that are hard to judge, such as the population to houses/planning restrictions, but there are an unbelievable number of empty properties now. Maybe it won't go that far due to lowish interest rates, but we need a further correction and the only reason we havn't had the forced sales is because banks have been allowed to hold onto unsold/unpaying stock for numbers of years and count it as asset at their chosen value, something other businesses are not allowed to do. My God - I've never seen anything more desperate! I hope so but am a bit cynical now as experience over the past 5 years has taught that if there is a right and a wrong decision to be made they will make the wrong one, or here in NI just do what they are good at and make no decisions, hence the services cut to zero suggestion. I do think some might sink any redundancy money in to property, most people I know if handed a big lump sum would do just that especially if there was enough money to buy outright without a mortgage even in the current market. If there are thousands of people getting lump sums it may very well negate some of the negative impact you might expect if they choose to put the money in to property. Thanks for all the replies everyone ! It's taken a fair bit of saving to get 20% raised so far, ideally I'd want 25% before buying. According to the ulster bank website max loan calc they'll give me £168,000.00. I'm looking about a £150k house at the most, I wouldn't be happy borrowing my max with interest rates only able to go up. I'm in the North Down / Ards area, but I've still seen some decent drops on propertybee in 3 bed semi sort of thing I'd be looking at. Staying at home with the parents sounds good for the finances, but the big 3 0 is looming for me and I'd like to get away before I retire ! Uve nothing to lose and everything to gain by waiting. Sit tight for another 6 months or so and then review your position. Best take the hit on this one... you can probably handle an earful now but it would be an awful lot harder to handle were you to find that your deposit had effectively been lost to further price drops, a year down the line! I'm in a similar position myself. I know that there are more falls to come but I've been waiting now for about 4 years to purchase. A lack of visibility in the local market makes it even more difficult to be sure that prices are actually are falling. The For Sale prices bear no resemblence to the agreed price. I seen a chart somewhere on here that stated the recent sale agreed prices in mainland UK were about 93% of asking price. On a £150,000 property that equates to £139,500. It is hard to see owners in some of the desirable areas here going for that, but without the visibility it cannot be confirmed. I've had enough of renting - currently I'm in a flatshare in order to bulk up my deposit but I'm still waiting patiently and not even considering the market before March 2011 now. When the banks were going down in 2008 I thought I could get something by 2010 but the recession/downward spiral of house prices has taken much longer than many expected. I think it's sellers' delusions rather than prices that are taking longer to kill off. With new build you get clarity as if they are not listed at the right price, the phone simply wont ring. There is no point factoring in a £10k 'haggling figure'. With the resale market you have no idea, unless you are bidding (and even then its questionable) as to what the sales figure is.